enclave has developed and lastly, Formentor, its emblematic coastline, beach and hotel, a setting that has welcomed intriguing cultural and political summits on a world-wide level. If you don’t know Pollença you simply must discover it for yourself, interact with its people, convivially accustomed to the foreign inhabitant who sees in this destination an idyllic place to live, admire the scenery that has drawn artists from around the world, etc. The style of this municipality is marked by the restlessness of its inhabitants in the areas of art, music and literature. The surroundings are characterised by landscapes in which the Serra de Tramuntana mountain range enters the sea. Visitors may wish to enjoy the festivity in which historical events of Pollença are re-enacted, to visit its weekly market in which produce from its land is still sold, to enjoy its international music festival, etc. A range of offers for which the destination boasts great amenities, excellent hotel and holiday infrastructure and a truly broad complementary range. What is available in Pollença? Hotel accommodation for over 6,600 visitors. 17 beaches and “cala” inlets. What is there to do in Pollença? A very recommendable destination for adults and families. Ideal for sports activities, both in the sea and in the mountains. Prepared for holidays focused on cycling across the island. Specialised in the observation of the Mediterranean’s birds. Interesting range on offer for culturally-oriented visits. Colourful calendar of cultural events. 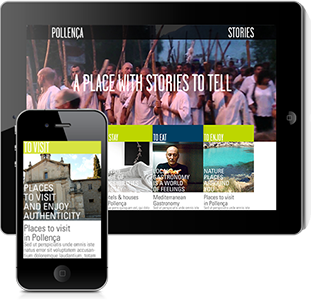 Get to know all of Pollença through this site. The entire gastronomic range on offer. Practice of sea and mountain sports. This presentation serves to assemble information and numbers of interest, allowing one to get an idea at a glance, as to the extent and characteristics of the tourism on offer within the municipality.